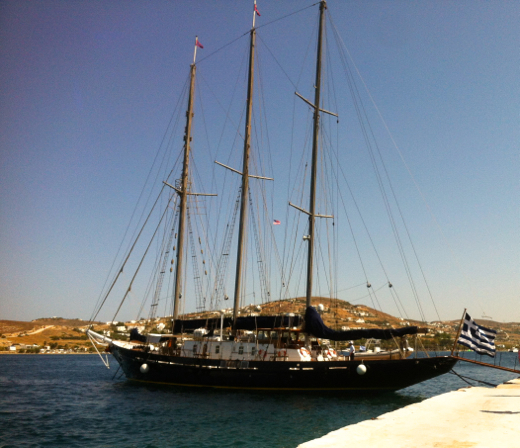 Here’s the deal… I was spoiled rotten by a tremendous vacation to Greece this summer. It was truly life altering for many reasons. I was blessed enough to get a much needed escape. I thickened some very cherished friendships. I developed some sure-thing life-long new relationships. And, I fell in love with the Grecian way of life. It really is so transforming to get out of your constant. 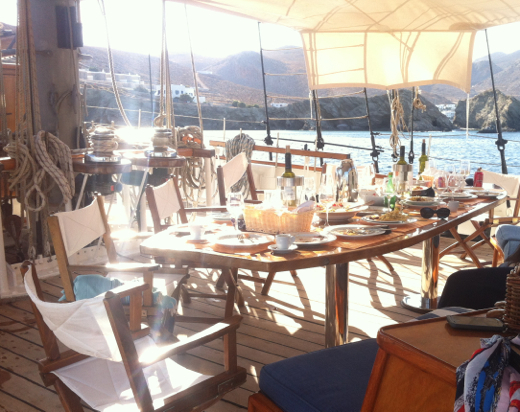 I experienced the archipelago for a week aboard the epic Sir Winston Churchill, a spectacular sailboat. I told you I was spoiled rotten…truly killed with kindness by the generosity of old friends. The color of the Aegean Sea is incomparable. The landscape of the islands is stunning. The food is delicious. Greece is a family style country. They pass and plate and share. They take their time. 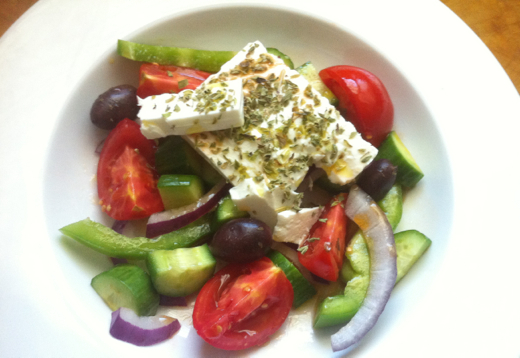 It’s really a lovely way to appreciate the understated goodness that is Greek food. In fact, one evening (night really…dinner doesn't happen until at least 10 o’clock), we went to a recommended restaurant on the island where we were docked. My fellow Americans had clearly not taken notice of the family style notion during our previous meals, and preceded to order “entrees” individually. Our confused waiter left the table and within seconds the chef appeared. He was bewildered by the number of duplicate requests of main dishes. Quickly, friends (whom had grown up spending the summers on the island) adjusted the order and set it straight. Then, slowly, large platters of deliciousness started to be shared around the table. The fruit of the nectar. The mid-days while on The Churchill will forever resonate with me. We would anchor ship at a swim spot. Jump in the insanely beautiful water. Dry off in the sun. Pour a glass of wine. And, gradually, gather around the large dining table on deck. Me being me, I would position myself so that I could watch the chef prepare our lunch through the galley’s port hole. And, then, exquisite dishes of seafood or traditional fare would be served. Every day was something different and delightful. Not a meal went by without some version of a Greek salad, which for anyone that knows me understands that this is a very good thing. It embraces two of my favorite things…peak in season tomatoes and cucumbers. The sweet, salty, tangy, crunchy, briny goodness of this effortless salad just makes me happy. It’s an ideal companion to any summer meal. Cut the vegetables into big chunks. This is not a diced salad the way that we see it in deli cases in The States. Top the salad with 1 or 2 big slices of feta, or several slabs if you’re making this for a crowd, generously sprinkled with oregano. Serve the salad in a shallow bowl or serving dish. This is not a tossed salad so there is no need for a bowl here. Be sure to have a big hunk of crusty bread to sop of the delicious juices that will accumulate. Always use the freshest vegetables, obviously. 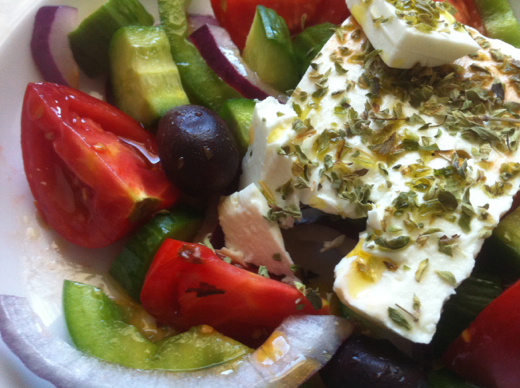 *Oh…treat yourself to a really good bottle of Greek olive oil! They’re wonderful. Makes 2 servings. Easily multiplied. The salad is absolutely satisfying with a splash or two of red wine vinegar, a healthy drizzle of olive oil and a good sprinkle of sea salt. But, I’m such a junkie for the liquid goodness that pools beneath the veggies that I decided to play around with a quick tomato-water dressing to amplify the salad’s nectar. Cut up the tomatoes first and season them generously with salt. Set them aside in a bowl. Allow them to sit for at least 15 minutes, and up to an hour. 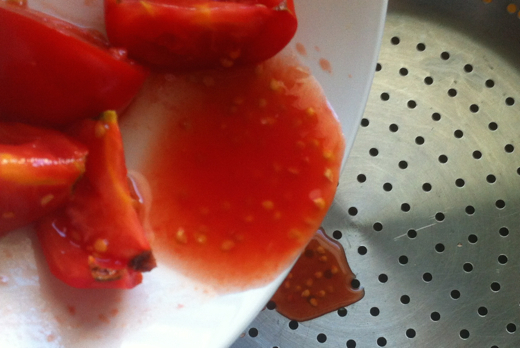 By now, a generous amount of tomato-water should have been drawn out of the tomatoes. Pour the tomatoes into a strainer over another small bowl. Add a hefty splash of red wine vinegar to the tomato-water. Whisk in olive oil. Pour some of the vinaigrette into the base of the serving dish. Arrange the vegetables and olives. Remember, this is a rustic easy dish, don’t over think the presentation. Pour more vinaigrette over the vegetables. Place the oregano topped feta cheese on the vegetables. Generously drizzle with olive oil. Finish with a bit more sea salt, if desired.